The caravan… an invitation to dream! This chic and nature oriented stay will transforms your childhood dreams and expectations in indelible memories of freedom and space, of fauna and flora, of carelessness and originality and most especially of love and brimful well-being. The image of the caravan is often rightly and instinctively associated to the trip, the escape and the Bohemian spirit that attracts more and more travellers in quest of new sensations and desires for originality. 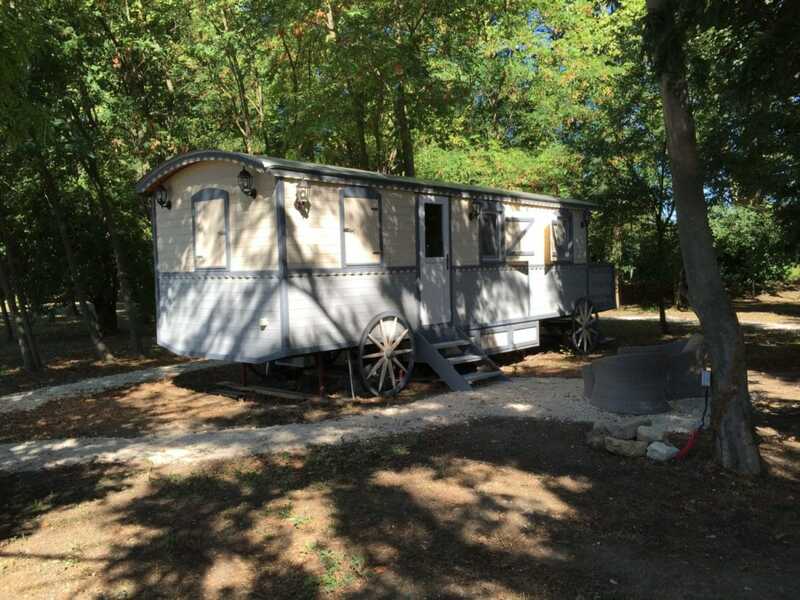 This in mind and the main objective to offer its guests an unusual,original and nature oriented stay,the 7 Mas Provençal has installed in a large field beside the Mas, an air conditioned and Wifi high-end caravan. Its interior is warm and has all the necessary amenities such as, a double bed with box spring and mattress comfortable for the mind and body, a kitchen with a sink, a hob, a hood, a refrigerator, a microwave, dishes, a dining room and many storage place. The full bathroom has a washbasin, a shower cubicle and a toilet. A garden table with chairs is available in order to dine in the open air and in a friendly atmosphere. This weekend in a caravan is a great opportunity to experience a new way of spending a short stay in this Provençal countryside, but with real intense and pleasant emotions, source of your future actions. There is nothing new with standardized leisure and is becoming almost banal and routine. Relaxing holidays, the ones which rejuvenate you and fill you with gaiety, joy and well-being, are those which make you live and discover new experiences and where the searched scenery is authentic, original, innovative and even unusual. It is the holidays which marks you with pleasant memories, a real source of pleasure which you can try just by closing your eyes and scrolling through these beautiful images and moments of happiness experienced in couple or with friends. Returning to nature is a vector of charm, dream and romanticism which tend to overpower you. But when reality catches up the dream and romance, your over equip caravan’s comfort is there so that this ambivalence of the soul should always graciously be served on the side it wishes to swing. The quality of life you will live during your stay is something you will enjoy. Recklessness, relaxation, idleness, evenings in the open, endless discussions but always pleasant around a typical Provençal meal, the spontaneity of encounters, the coincidence of events, coloured scenery which attracted Van Gogh or Cézanne are the things that will undoubtedly make your weekend in a trailer of the 7 Mas Provençal an unforgettable one.